The HD10CEA converts SD/HD-SDI video with embedded audio to analog video and 4-channel balanced analog audio. SD video outputs can be configured as YPbPr (Betacam or SMPTE/EBU-N10), RGB, composite or YC (S-Video). HD video outputs can be configured as YPbPr or RGB. Analog audio outputs are balanced. The 4 audio channels can be selected from group 1-4. The HD10CEA converts SD/HD-SDI video with embedded audio to analog video and 4-channel balanced analog audio. SD video outputs can be configured as YPbPr (Betacam or SMPTE/EBU-N10), RGB, composite or YC (S-Video). HD video outputs can be configured as YPbPr or RGB. Analog audio outputs are balanced. The 4 audio channels can be selected from group 1-4. Audio and video output connections are available on a 25 pin "D" subminiature connector (breakout cable supplied). All video/audio configuration is done by external dipswitch selection. 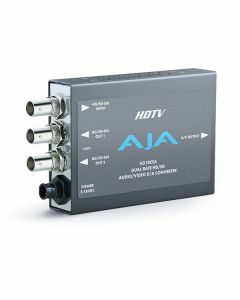 This versatile, low-cost, miniature monitoring solution also outputs two loop-thru SDI/HD-SDI outputs.